The term rain gardens sounds kind of romantic. I imagine something vaguely tropical with exotic blossoms amid rain drenched foliage viewed from a wicker chair on a veranda. In reality a rain garden can have colorful blossoms, not necessarily exotic, but when the foliage is rain drenched the rain garden is doing its work of infiltration. Infiltration is not a romantic term. I have heard the term rain garden and seen Master Gardener work sheets on building a rain garden, but until I heard Ed Himlan, Executive Director of the Massachusetts Watershed Coalition (www.commonwaters.org), speak at the Greenfield Public Library last week, I had no idea of how important rain gardens could be to a community’s department of public works, the health of our waterways, and our own health. Statistics can be boring, but the numbers that Himlan brought to the meeting were riveting. He said that 90% of the pollution of our waterways, streams, ponds, lakes and rivers, comes from stormwater runoff. How? By carrying sediment, oxygen depleting materials like leaves, toxic chemicals from pesticides, herbicides and insecticides, heavy metals like zinc, lead and mercury, and bacteria from pet waste. Pollution of our waterways is evident to those who use them for recreation. Fishermen will tell you that brook trout are gone. And many of us have been disappointed from time to time that we cannot swim or go boating because the water is too polluted. In our urban and suburban neighborhoods where there is so much paving, of roads, sidewalks, parking lots, malls and other buildings, there is no place for storm water runoff to go except into the streets and inadequate drainage systems which discharge all these pollutants into local streams and rivers. Himlan also gave a corresponding positive statistic. He said that rain gardens can keep 96 % or more of stormwater runoff on site, keeping it from polluting waterways, and letting it infiltrate and recharge groundwater supplies. The rain garden will filter and clean the water that will ultimately make its way to local streams. We who live amid large lawns may think we have done our duty in capturing rainwater, but turf grasses are only about 30% permeable. They form a hard surface that rain penetrates with difficulty. Those who want to see a rain garden in action can visit the rain garden that was created and planted behind Greenfield Library last year. The process is not complicated. Remove the sod and dig a hole up to about 18 inches deep – of whatever size you wish. Any flower bed should be of substantial enough size to allow for the planting of shrubs, or even trees as well as perennials. The depression can first be filled about halfway with coarse sand or small gravel. Then add a layer of leaf compost, and finally a smaller layer of soil. It is important to leave a sufficient depression, five or six inches, where rain can collect, puddle and slowly sink into the ground. Mosquitoes are not a problem because they thrive in standing water, but a rain garden drains within just a few hours. Native plants are a good choice for rain gardens because they will also attract indigenous birds and butterflies. It is not hard to find lists of plants suitable for rain gardens on the Internet. Some of my favorites are daylilies, cardinal flower, Joe Pye weed, turtlehead, Queen of the Prairie, sensitive fern and baptisia whose roots grow 25 feet into the ground, leading water deep into the soil. Some of the trees or shrubs that can be added to a rain garden include river birch, elderberry, winterberry, and summersweet. When you choose plants they should not only tolerate the wet, but be chosen for the amount of sun or shade your site gets. It is amazing how much water can sheet off a roof during a storm. A good place for a rain garden is where the rain comes off the roof or from a downspout. To protect the house it should be located at least ten feet away from the foundation. If you have drainspouts, additional pipe can be added to direct water into the rain garden. Clean potable water is taking its proper place as a priority concern. We all need water to maintain life, and to maintain the lives of the plants, animals and fish that make up our diet, as well as the beauties that feed our souls. We need to use a multitude of ways to encourage rain infiltration on site. We can increase the permeable surfaces in our own landscapes by including groundcovers, trees and shrubs as well as flowers and lawn. We can use rainbarrels, although it must be noted that a 55 gallon barrel fills quickly. We can use permeable materials for our driveways and patios. 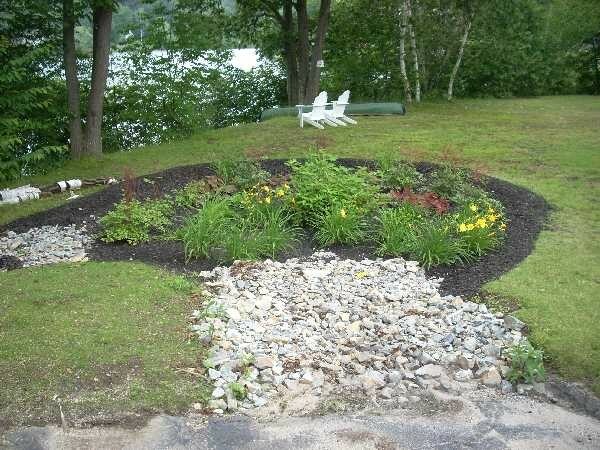 Himlan is working with his town of Leominster to install rain gardens at municipal sites as well as encouraging their creation on residential properties. Michigan, Vermont and other states are encouraging the creation of rain gardens. There are now rules for Low Impact Development (LID) where there is new building that will emphasize permeable surfaces – and rain gardens. Ed Himlan was invited by Ed Gorecki, a Greenfield Public Library Trustee, and the talk was co-sponsored by Greening Greenfield. 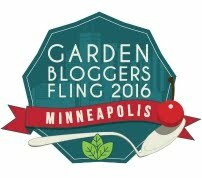 The large audience was filled with gardeners. I think the town can look forward to some new rain gardens. I’d like to hear about them. If you are planning a rain garden, please email me at commonweeder@gmail.com.